The national drink of Ethiopia is T’ej, a golden sweet honey-wine. T’ej is a mead that is indigenous to Ethiopia with roots going back to the 4th century. In Ethiopia, T’ej is made in private homes for family consumption and is not sold commercially. Each household has its own family recipe and variations in taste result from the type of honey used, temperature, climate, materials and utensils and the time involved in making the mead. Ethiopians purchase gallons of honey at a time to produce the mead and the taste can be as individual as the imagination of the person making it. The same recipe can vary from mother to daughter, for the mead is made from instinct as much as from a recipe. 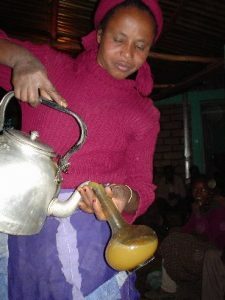 In Ethiopia, T’ej is consumed at mealtimes and as a cocktail. Traditionally, it was also used to toast the bride and groom at weddings. Although grapes and grape wines were introduced into Ethiopia some thirty years ago and today the countryside is dotted with vineyards, the preferred wine is still T’ej. 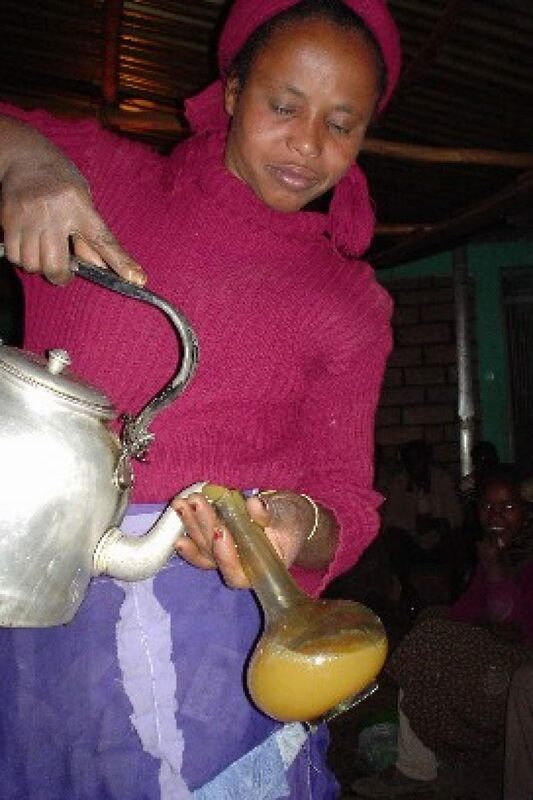 The extract of a native Ethiopian tree, the Gesho (similar to Hazel) imparts a bitter quality to the T’ej making it the ideal drink to complement the spicy food of the Ethiopians. The honey- sweet, bitter, dry tone of T’ej is enhanced by the food. Ethiopian meals often consist of pureed vegetable greens, lentils, peas, cabbages, bean sprouts, squash and meat – chicken, seafood and lamb. This is all served on a communal plate with injera, a sourdough, uncooked, unleavened bread. Injera is rolled and folded in the manner of a napkin and placed on the rim of the dinner plate or on a side plate. Three years ago, Ethiopian nationals who have relocated in the Washington D.C. area, approached Anthony Aellen, a maker of Medieval English-style mead for nearly nine years at the Berrywine Plantation in Mt. Airy, Maryland. The Ethiopians were looking for a winemaker who would be willing to try and produce some T’ej similar to the drink they had enjoyed at home. It took Aellen nearly a year and a half to make a satisfying duplicate of T’ej. Berrywine Plantation is the only know manufacturer of T’ej in the United States and has been supplying the Red Sea Restaurant in Washington D.C. exclusively for the last three years. Last year, Aellen produced close to a thousand gallons of T’ej. Since T’ej is a highly sensitive wine that does not travel well, Aellen suggests shipping the wine no more than a thousand miles until the cause of the instability is found. Although in Ethiopia the supply of T’ej is abundant, in America it is very limited. The only other known manufacture of T’ej is at the London Winery of Ontario, Canada, which supplies various restaurants and liquor stores in the surrounding Washington, D.C. areas. The Ethiopians have brought to this country a mead that is central to their culture and history. When glasses are filled with T’ej, they contain the same golden drink that was enjoyed by King Solomon and Queen Sheba. Mix water and honey in 3 gallon container. Set aside in a warm room. After 3 days, put 6 cups of honey water in the medium cooking pot. Bring to a boil and simmer over low heat for 15 minutes after adding woody hops. Set aside to cool. Add mixture to 3 gallon container. Let stand for 5 days. Remove hops using strainer. Cover container for 15 or 20 days. Store in cool location or put in bottles and refrigerate after filtering. Serves 6 to 12. For more sweetness: add more hops to the mixture and cover in an airtight container for 2 to 3 days. If bitter: add 1 cup honey and cover in airtight container for 20 to 25 days. The additional ingredients are added after the hops are removed and before storing the covered container for 15 to 20 days.